Online Bingo players know what being cozy is all about. Whether it is playing in your jammies and fuzzy slippers or sitting comfortably in your easy chair Comfy Bingo puts the emphasis on feeling good. A great big adorable smiley face welcomes you on the homepage as the web design displays a cozy couch to sprawl out with your laptop and let the games begin. Comfy Bingo’s name alone sets the atmosphere for a relaxing good time. Grab a cup of hot tea and take in all the games they have to offer. It will soon be your second home while you’re still in yours. The Featured Player adds a warm bingo community as you read their comments and lets you get to know your bingo roomies on a more personal level. The games are designed to bring players the best bingo in the industry. Powered by Cozy Games (another comfy word) players are assured it is quality gaming. Comfy Bingo is a member of the LBN, a strong network of bingo sites. Players will be in bingo heaven to know there are 4 variations of bingo to play. Yes four, how amazing is that to have all bingo options at one site! If you haven’t tried all the different bingo games out there now is a perfect time to get your feet wet and try them out. Bingo Games include 90, 75, 80 and 30 ball bingo with a total of 6 bingo rooms to join. Progressive Jackpots, Grand Progressive Jackpots, Queen Progressive Jackpots and Speed Progressive Jackpots keep the ole ticker thumping fast with excitement. There are a slew of Slots to play and the nice thing about them is having the choice to play with Bingo Bucks and Cash. Hot Habanero Slot is flaming hot like a chili pepper with an exciting Bonus Game for a chance to spin the big wheel for incredible prizes. Casino Games offer a dab of variations for those gamblers anxious to place some bets at the tables. Have instant fun with Scratch Cards and scoop up extra-large cash prizes. You will immediately feel right at home and super special with a Free No Deposit Bonus offer you won’t want to pass up. Let yourself go and give all the games a whirl and discover your all-time favorites. Comfy Bingo is rolling out the welcome mat with three juicy Deposit Bonuses making players feel as warm and comfortable as possible. There are several tabs on the Promotions page with sensational offers including Today Specials, Monthly Specials, Slots Promo, Bingo Treat, 75 Specials, Hot Promos and Deposit Specials. Comfy Bingo creates a magical environment for a relaxing down home feel. Bingo Bucks can be played on any of the games offered with no limitation to choices. Promotions are plentiful for continuous thrills. We rate Comfy Bingo with 4.5 Pink Hearts. Definitely proves true to its name. This is one cozy little site that has a truly friendly atmosphere and great customer support that really is there to help. They have a live support option which is always better because you tend to get responses much more quickly when you have an issue or question. Their bingo is not bad either. They have six different rooms for players to choose from on a daily basis, including a free one, which everyone loves! If you head over to their red bus room, they have designated times each day where you can play for free. But besides that, their prices are fairly low anyway. My only complaint at comfy bingo would be the selection of games. They seem to be a bit limited for my taste compared to other sites. I would just like to see a bigger collection. Although, I do see that every once in a while they add new games, so maybe they will get there eventually. I would definitely recommend them! Time to get comfortable and cozy on up to Comfy Bingo. This laid back site gives you a £15 No Deposit Bonus when you sign up and also provides you with plenty of opportunities to play bingo for free. 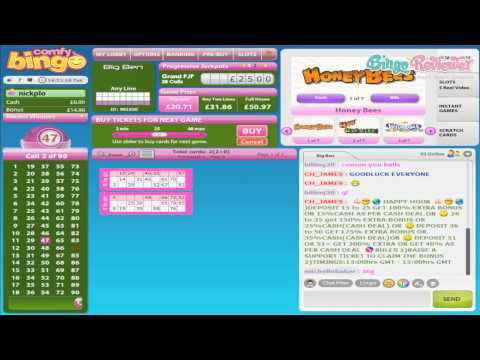 Once you have won a few games of bingo you'll also want to try out the other games on the site. Since they are a Cozy software site you know you are in for a good time. They have a wide variety of slots, casino games, and scratchcards for you to enjoy. A new feature is being able to play at Comfy Bingo from your mobile device. So take the site with you at home, on the road, or at your favorite comfortable destination. You are never far away from your bingo fix, and from winning some amazing prizes. Deposit at Comfy bingo and you will be treated with a 750% Bonus so that you have all of the playtime you want and lots of opportunities to win. If you need help on site, live chat is just a button click away. I really enjoy this site, but they could stand to do a little more with their layout. I found it to be a little plain. It doesn’t do them justice. A great site like this should have a nicer looking homepage than that! They give away a pretty nice welcome offer just for signing up. To start off, they give you £15 for free, and there is no deposit required to receive that free cash. I was able to use this cash to play some of their games for free for a while. It gives you a nice opportunity to try out their games and get a feel for what they have to offer and which games pay well. They have the basic versions when it comes to bingo: 75 and 90 ball as well as an exciting daily jackpot lounge to spice things up a bit and make things more fun. Great site for those who like to sit back, relax and play favorite Bingo games. There are 10 rooms in total, with the classic 75 (1 room) and 90 (6 rooms) ball games, but also have the popular 80 (2 rooms) and even the 30 (1 room) games, so you're covered for all your bingo needs. Don't worry, you will find even the Slots in here, and in addition the Scratch cards (I love to play those from time to time), but also the regular casino games, so I would say that this site has it all in one place. However, the focus is on bingo, with cards costing from 5p and with a pre-buy option. If you like freebies, you will enjoy £15 No Deposit bonus, in addition to a huge 750% bonus on your first three deposits (200%, 250% and 300% respectively). If that's not enough, you should know about the 20% cash back on all Slot games.